Congratulations to CDR BJ Armstrong for being named the 2019 Clements Award for Excellence in Teaching. The Dean's citation reads, in part, "A member of the History Department, CDR BJ Armstrong is a PMP who has been teaching at USNA since the 2016 academic year. He teaches a variety of history courses, including American Naval History, History of Air Power, and The Navy in the Wars of the Early Republic. An outstanding officer and professor, CDR Armstrong focuses on creating an active, discussion based learning environment through a pedagogy that incorporates digital technologies, engagement with primary sources, and critical reasoning skills to help midshipmen learn to deal with complexity and contingency and develop excellent communicators ready to tackle hard questions. CDR Armstrong’s active engagement with his colleagues in the department on topics of pedagogy and teaching methods, and encouragement of scholarship from both civilian and military members of the department, have continued greatly to reinforce the strengths of the Department of History." Again, Bravo Zulu, CDR Armstrong! Professor Tom McCarthy has just published a new monograph entitled "Developing the Whole Person: A Practitioner's Tale of Counseling, College, and the American Promise," [Peter Lang Inc, Oct 29, 2018]. Based on his father's life and legacy, Professor McCarthy explores the achievement and difficulty of postwar counseling psychologists and academic administration in American higher education. Congratulations! Congratulations to Associate Professor Brian VanDeMark for his new book, "Road to Disaster: A New History of America's Descent into Vietnam [Custom House, September 2018]. Reviewer Robert Dallek considers it "The most thoughtful and judicious one-volume history of the war." Bravo Zulu! Assistant Professor Amanda Scott has signed a book contract with the Cornell University Press for her manuscript "The Basque Seroras: Local Religion, Gender, and Power in Northern Iberia." Congratulations! Congrats to Dr. Joseph Slaughter for receiving the Communal Studies Association 2018 Donald F. Durnbaugh Starting Scholar Award for his paper "Harmony in Business: Communal Capitalism in the Early Republic" which will be published by the peer reviewed Communal Studies journal. LCDR Joseph Slaughter is now "Dr. Slaughter." He received his PhD in early U.S. history from the University of Maryland at College Park in December 2017. Congrats to Joe! Professor Bill McBride reported that he has signed a contract, after a vigorous peer review process, with the Cambridge University Press for his next book project entitled "War, Science and Technology: A History." Congrats! This book will be a part of Cambridge University Press' New Approaches to the History of Science and Medicine. It is expected to come out in the winder of 2020. "This award, established in 1996, is intended to recognize and encourage relatively junior individual faculty members at the Naval Academy who have had a demonstrable impact on their students and/or who have made a significant contribution to the art of teaching and counseling students...LT David Stira is an ideal military faculty member whose mentorship in and out of classroom is simply unparalleled. In just two academic years, he built his own curriculum for HH216, The West in the Modern World, and created from scratch an upper-level elective course: HH386D, Cold War Confrontations. The honest and open environment that LT Stira cultivates in his classroom makes it no wonder that his courses are always in high demand. His course evaluations consistently reflect that midshipmen not only respond to LT Stira’s engaging and relevant material, but also they appreciate his high academic standards. His innovative teaching methods have been adopted by other faculty members, military and civilian alike. LT Stira’s infectious enthusiasm for mentorship extends outside the classroom as the officer representative and head coach of the Navy Ultimate Frisbee team, a role to which he has dedicated over 1000 hours of his free time. All in all, LT Stira is a vibrant, relatable instructor who students see not simply as someone behind a lectern, but a mentor and ideal naval officer." Hearty Congrats to Associate Professor Wayne Hsieh whose weighty volume, co-authored with Williamson Murray, has just been published by Princeton University Press [September 2016]. "A Savage War: A Military History of the Civil War" (ISBN: 978-0691169408) has received rave early reviews. Well done, Assoc Prof. Hsieh! Congratulations to our Associate Chair Chris Rentfrow who was officially promoted to the rank of captain on July 1, 2016. Well done, Captain Rentfrow! 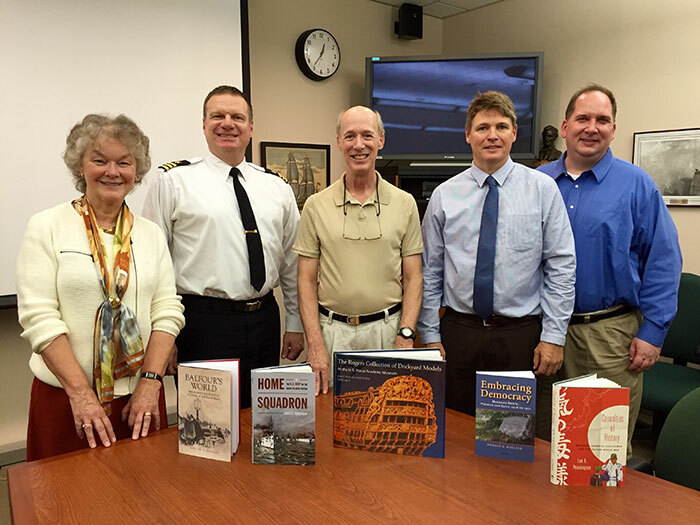 The department held a book party on Nov. 4, 2015 for five colleagues who published books recently. Congrats to, left to right, Professor Nancy Ellenberger, CDR. Chris Rentfrow, Grant Walker, Associate Professors Donald Wallace and Lee Pennington, on their superb research accomplishment. Professor Miles Maochun Yu has co-edited, with Lowell Dittmer, and published the book, Routledge Handbook of Chinese Security [Routledge, June 2015] (ISBN: 978-0415855433). It's an anthology by 22 world-class experts on the history, strategic perspectives, specific mechanisms, and organizations of various aspects of China's military, geopolitical, traditional and non-traditional security. Congrats! Hearty congrats to Dr. Mark Hagerott of the History Department on being selected as the next chancellor of the North Dakota University System. starting July 1, 2015. With 11 universities and colleges under his watch, Mark is once again taking on a big responsibility, as he has done throughout his naval career around the world and during his many years of teaching at the Naval Academy. LT John Kadz has been selected as the 2015 recipient of the prestigious Apgar Award for Excellence in Teaching. This award is intended to recognize and encourage relatively junior individual faculty members at the Naval Academy who have had a demonstrable impact on their students and/or who have made a significant contribution to the art of teaching and counseling students. The award is presented to a junior military faculty member in odd years and to a junior civilian faculty member in even years. Congrats, LT. Kadz! Associate Professor Sharika Crawford has been awarded a Fulbright Scholarship to Colombia (2015). She will be affiliated with the History Department at the Universidad de los Andes in Bogota. Congratulations! Congrats to Associate Professor Lee Pennington for the publication of his book, Casualties of History: Wounded Japanese Servicemen and the Second World War (Studies of the Weatherhead East Asian Institute, Columbia University), (Cornell University Press, April 2015) (ISBN: 978-0801452574). Associate Professor Lori Bogle's lecture was taped and shown on C-SPAN. Congrats! Please see the AH American History TV website. Professor Brannon Wheeler was recently interviewed online on Quran manuscripts, For details please view the Brannon Wheeler Qur'an Manuscript page. “’The crimes by which Wulfbald ruined himself with his lord’: The Limits of State Action in Late Anglo-Saxon England.” Reading Medieval Studies 40 (2014; Special issue: Law’s Dominion in the Middle Ages: Essays for Paul Hyams. Ed. David Postles). Pp. 42-53. “Cultural Representations of Warfare in the High Middle Ages: The Morgan Picture Bible.” Pp. 13-35 in Crusading and Warfare in the Middle Ages: Realities and Representations. Essays in Honour of John France.” Ed. Simon John and Nicholas Morton. Ashgate Publishing, 2014.